It all began in my early teens when, together with my mates, we would muck about on a couple of 50cc trials bikes at each others houses. In those days, you could become road legal aged just 14 and after much persuasion, I finally managed to convince my Dad to let me get my own bike. Ok, so I have to admit it was only a Honda scooter but at least it had gears and a reliable 4 stroke engine. It wasn’t long though before I got my first proper bike…a Honda CB125. My pride and joy, it gave me the freedom to travel far and wide and in 1975, aged 16, I undertook my first big road trip from St Malo to Dijon. I guess it was during this trip and the several weeks spent at a ‘Colonie de Vacances’ that lead to my lifelong love affair with La Belle France. Over the years, I’ve owned a number of different bikes and have ridden extensively in numerous countries, often tagging a few days onto business trips to explore the local area on borrowed or hired bikes. Today, I mainly ride a 2012 Yamaha XT1200 Super Tenere whilst enjoying the occasional cruise on a 2016 Indian Chief Dark Horse or my trusty old 1996 Harley Springer Softail. 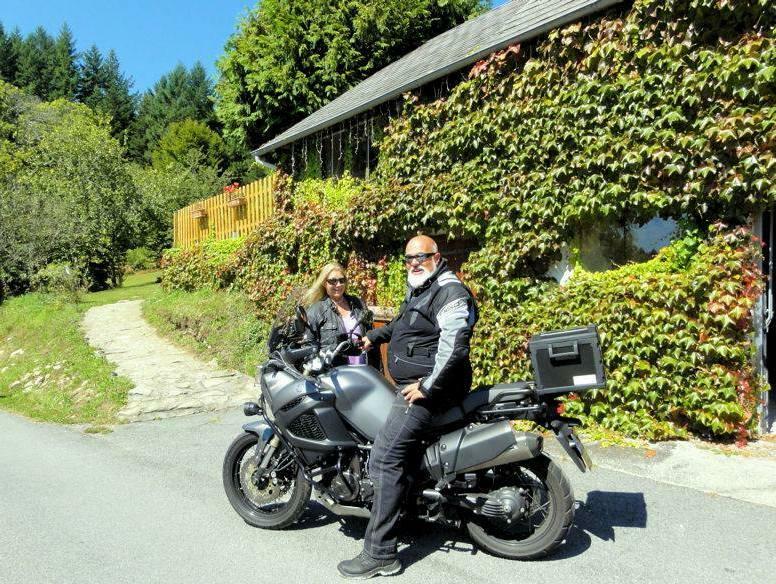 Our acquisition of Riders Rest, with its 10 years of dedicated service to the biking fraternity, brings together not only a desire to share our passion for France but also to welcome fellow bikers to our wonderful home, high up in the hills of the Limousin. My first taste of biking came in 1983 on only my second date with Rob. After arranging to meet me on the A23, a few miles north of Brighton, he arrived 40 minutes late on his ‘clapped out’ Yamaha 250 US Custom to be greeted by one very unhappy lady. Thankfully, my first ride as a pillion changed all that and we haven’t looked back since. A few years later, Rob persuaded me to get a Provisional Licence and try my hand at riding myself. Sadly, this ended in disaster 2 weeks later after I hit a lamp post and became trapped under the bike with petrol leaking out of the tank. Although this put paid to my desire to ride my own bike, my love of being on the back and the exhilaration of the open road has never wavered. So, for me this move to France with its beautiful scenery, fabulous food and traffic-free roads is like a dream come true. And to be able to host bike-minded people in my own home for a living, well…say no more !